United States Strategic Bombing Survey (USSBS) photo of the steps of Sumitomo Hiroshima Bank, Kamiya-Cho, 850 feet (260 meters) from the hypocenter. In the flash phase of the bomb, the fireball at the hypocenter reached several million degrees Centigrade and a diameter of 90 feet (28 meters) within one-ten thousandth of a second. One second later, the expanding thermal energy hit the Sumitomo bank with a surface temperature of 9,000 degrees Fahrenheit (5,000 degrees Centigrade). Three seconds after the explosion, the fireball had a surface temperature of 3,100 degrees Fahrenheit (1,700 degrees Centigrade). The fireball ignited every flammable material for over two miles (3.5 kilometers), creating a firestorm that lasted for six hours. Organic elements, including plants, animals and humans, were incinerated, leaving the ground where they walked or sat less damaged than the surrounding area. Several people were on the steps of the bank after the all-clear sounded at 8:15 AM waiting for the bank to open when the bomb exploded. Akiko Takakura (1925- ), exposed at the Bank of Hiroshima 500 feet (150 meters) from the hypocenter, crawled through the Sumitomo Bank to escape the firestorm and found everyone dead inside. Contrary to popular myth, substantial organic remains were present after the blast and removed within a few days or weeks of the explosion. By October 1945 the streets were cleared, and within a few months the bank was back in operation. The USSBS recreated the event on film using a Japanese soldier who sat for the cameras in the dead person's "shadow." 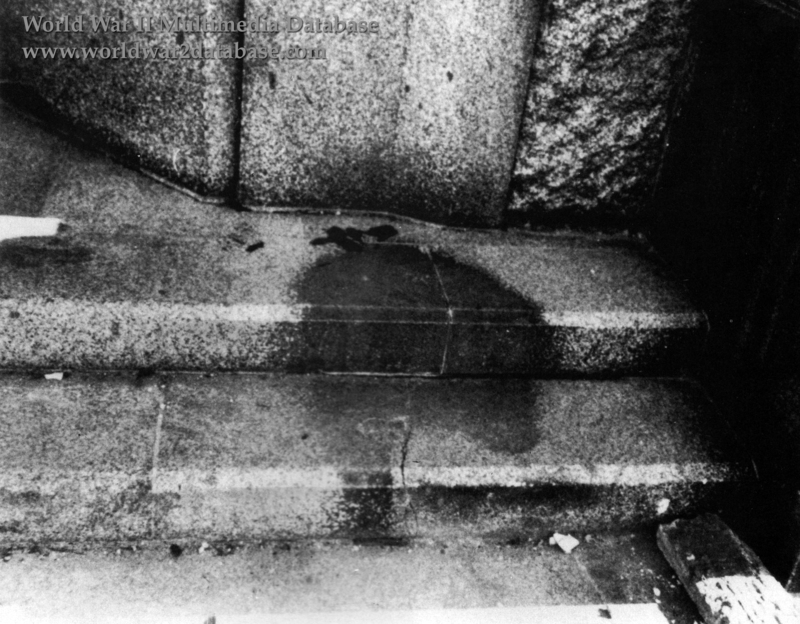 The British Mission to Japan photographed the area and noted that another vaporized person was standing against the plinth adjoining the steps. Within ten years the shadow, then called "Hito Kage No Ishii" (Human Shadow Etched in Stone) began to fade. The dark mark on the stone was first fenced off and eventually encased in glass by the 1960s. When the Sumitomo Hiroshima branch was torn down, the steps were preserved and donated by the bank to the Hiroshima Peace Museum where it arrived on February 2, 1971. The "Human Shadow Etched in Stone" was presented to visitors, but the shadow continued to fade. In November 1996, Mitsuno Ochi (1903-August 6, 1945) was identified as the person killed on the steps by her family. Ochi, from Okimi, Saeki District, Hiroshima, was seen by witnesses waiting for the bank to open to withdraw interest on a deposit; her fire insurance policy was found nearby. Workers removing the dead told the family that the victim on the stairs seemed to be a small woman. The family's request for identifying Ochi as the victim was supported by Li Sil Gun, who leads the Hiroshima Korean Hibakusha Association, among others. Noting that an Osaka visitor the day of the atomic attack identified the victim as someone else, the Hiroshima Peace Museum placed an additional placard stating, "A descendant living in Okimi-cho (Saeki-gun) has noted that this shadow may have been created by her mother, Mitsuno Ochi (42 years old at the time)." In April 2001, scientific analysis revealed the shadow was composed of organic matter that could not be identified, but was probably clothing, hair or skin and not the original surface of the bank steps. Date estimated.